After a whirlwind trip to Cologne, it was time to move on to a new fairytale. 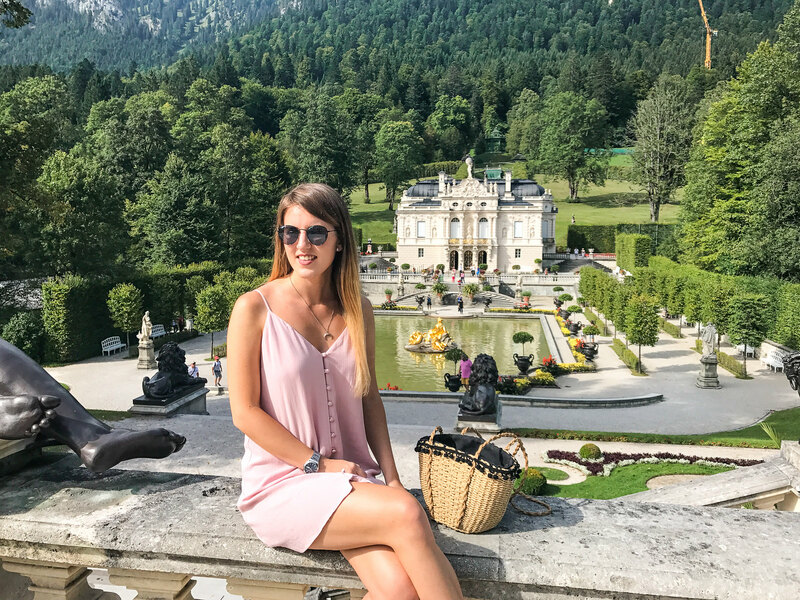 I hope you’re not sick of the summery blog posts yet because I still have a few more to share with you, and today’s is a trip to the beautiful Bavarian palaces of King Ludwig. Ever since I first watched Chitty Chitty Bang Bang as a child, I said that one day I would visit the castle for real, and this summer that dream finally became a reality. 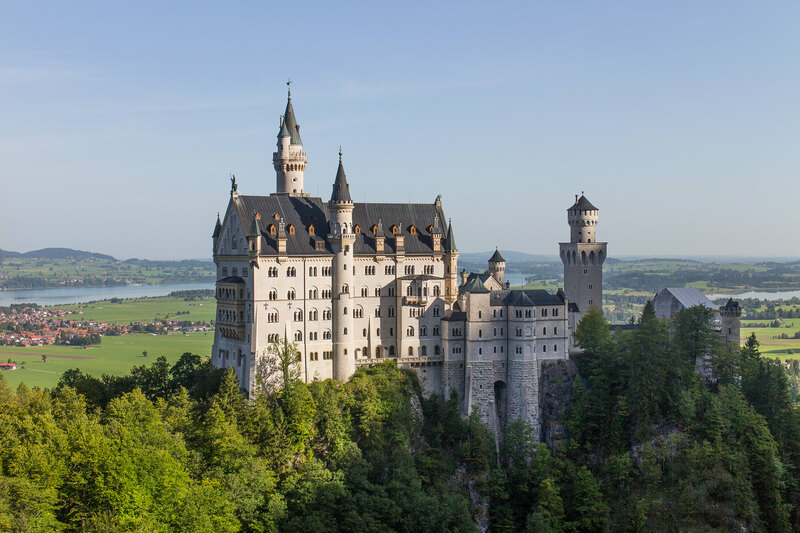 Nestled in the middle of the southern Germany countryside you will find Schloss Neuschwanstein, the castle used as the setting for the wonderful film Chitty Chitty Bang Bang. I’ve also heard that it inspired Walt Disney when designing the Disney castle itself. 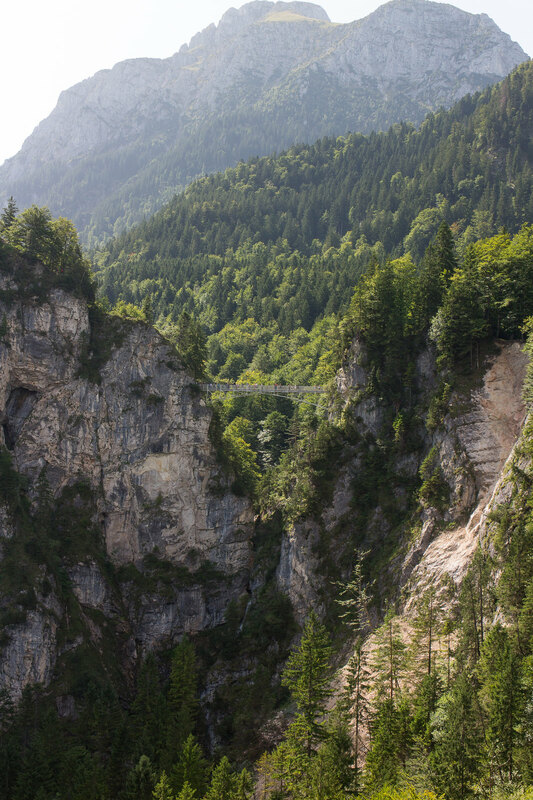 Naturally with both of these facts, it was an absolute must must see for our road trip down to Austria. 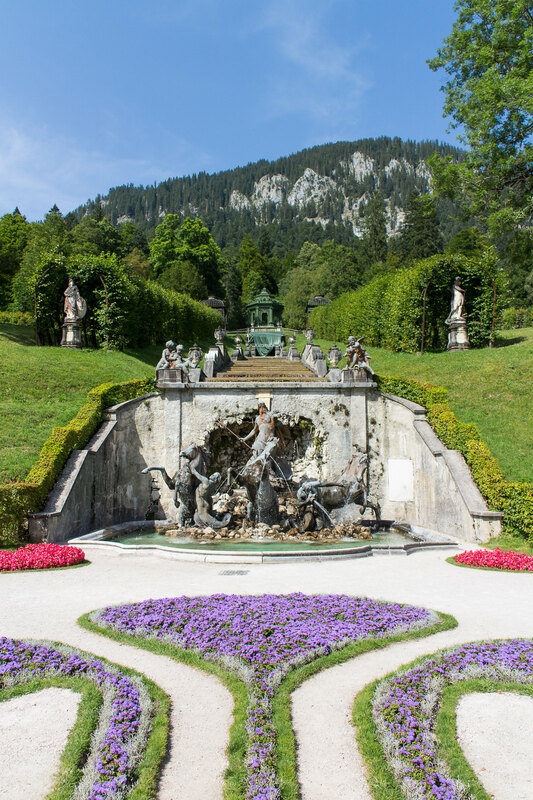 Built by King Ludwig II in the 1800s, this incredible castle sits perched atop a patch of mountain nestled in the lush fields and hills of Bavaria. Sadly you cannot take any photos inside so I can’t show you anything but the outside. Have a little google if you want a nosy to see what lies behind these doors. Or better yet, visit for yourself! The palace was never completed after the king’s death so a large amount of the palace is unfinished and you are unable to see it, but in all honesty the best part is the views out of the windows of the palace. I can’t even imagine how incredible it would be to live there and wake up to those landscape views every morning. 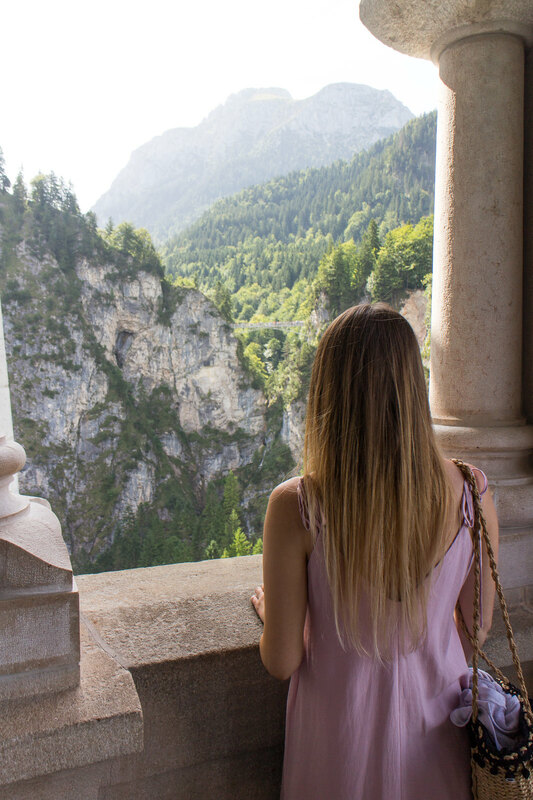 One of the balconies actually enables you to look out across the valley to the Marienbrucke bridge which is where you can take the famous photos of the castle perched on the mountain like the one earlier in this post. I’m not great with heights, and this definitely was a challenge because as you can see, it’s a small bridge and a big drop! But it was 100% worth it for the insane views of the castle. 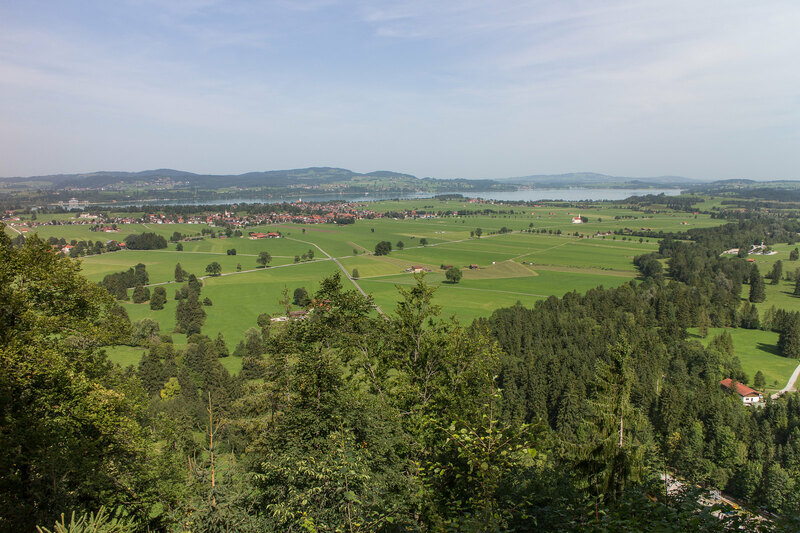 After finishing off the morning at the Neuschwanstein Castle we made our way on to our next destination, which involved dipping into Austria for a little while. 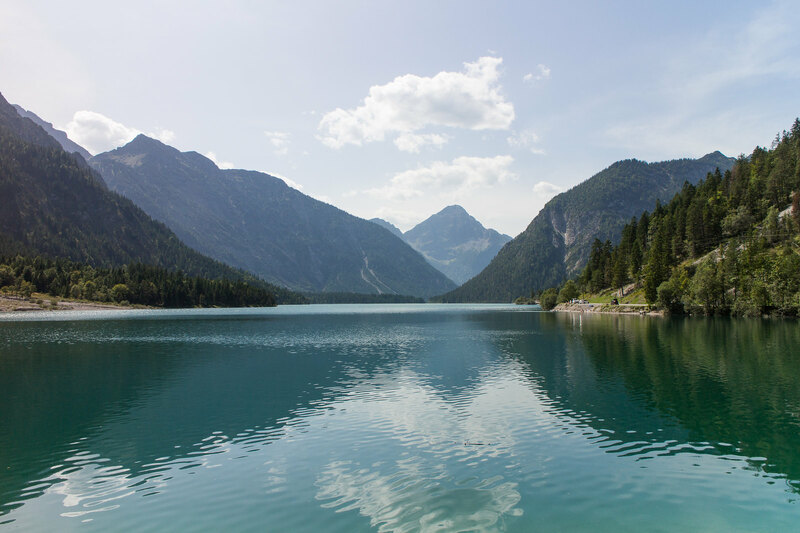 As we were driving we stumbled across the most incredible lake which we believe is called Plansee, but do correct me if you know otherwise! We couldn’t resist getting out at every opportunity and taking a million and one photos. The gently rippling waters, mountain backdrop and perfect sunny day just made for the most awe-inspiring landscape. It’s time’s like this that nature just makes me take a step back and think ‘wow’. But after many oohs and ahhs we had to dash off to our next destination! 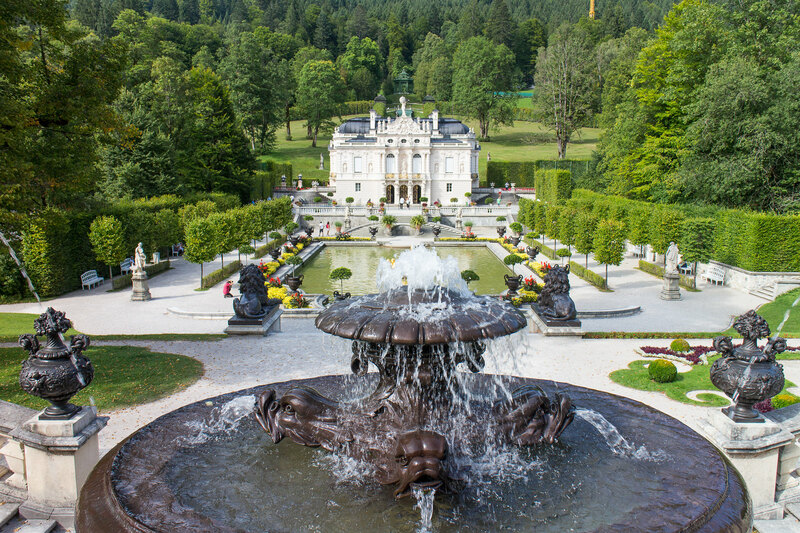 Schloss Lindenhof, another of King Ludwig II’s masterpieces. 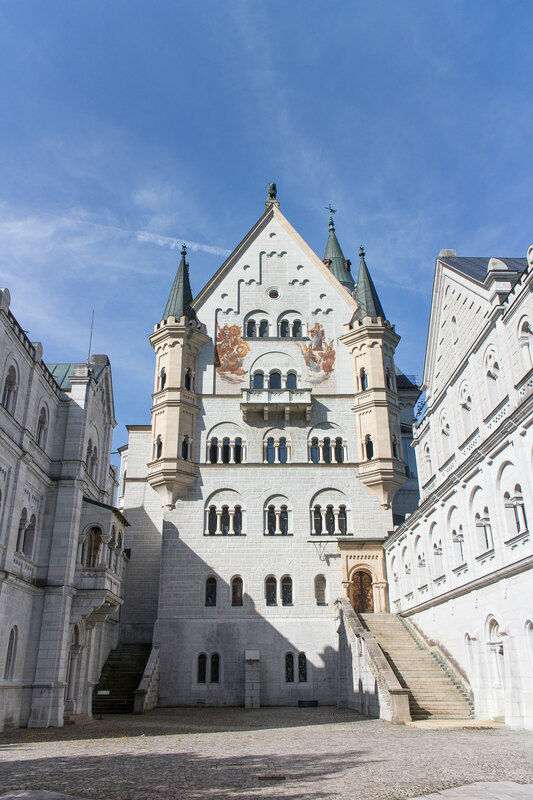 This palace, unlike Neuschwanstein, was finished before the king’s death and he lived in it for a time before he passed away. 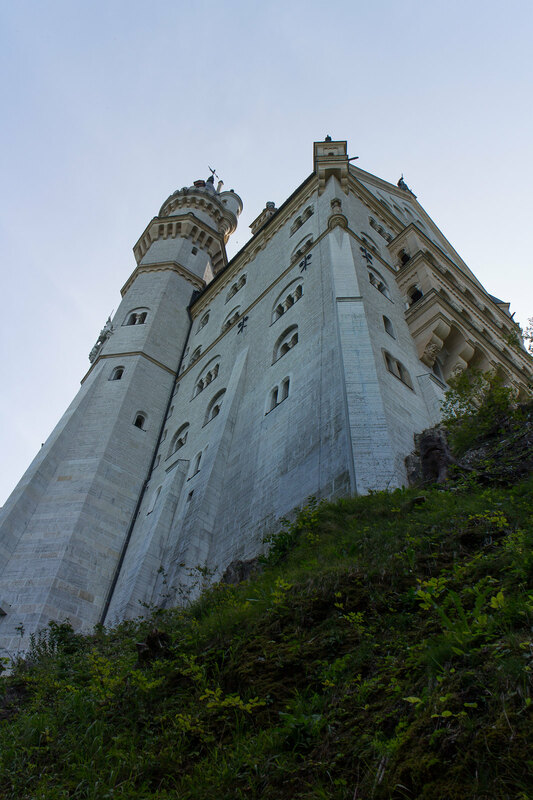 If you visit Neuschwanstein and think this will be much the same, let me assure you it is a complete world apart. Again, I couldn’t take any photos inside but honestly, the interior of this palace is off the charts jaw-dropping. 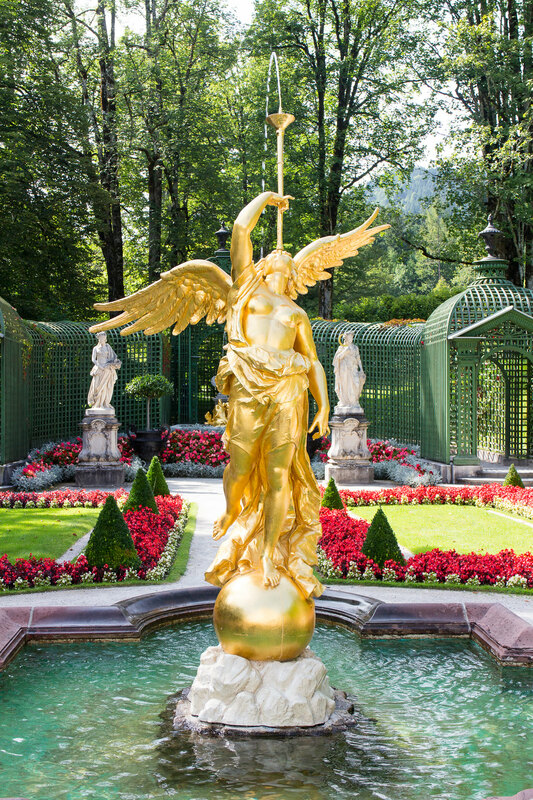 I have never seen so much gold, mirror and porcelain in my life. And I love a good palace so I’ve seen quite a few. 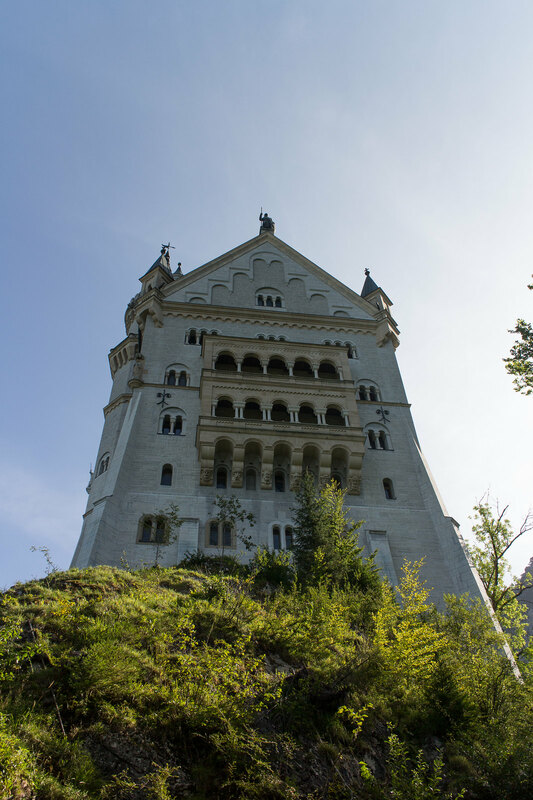 While it is much smaller in stature than Neuschwanstein, it holds a treasure trove inside of design and beauty. 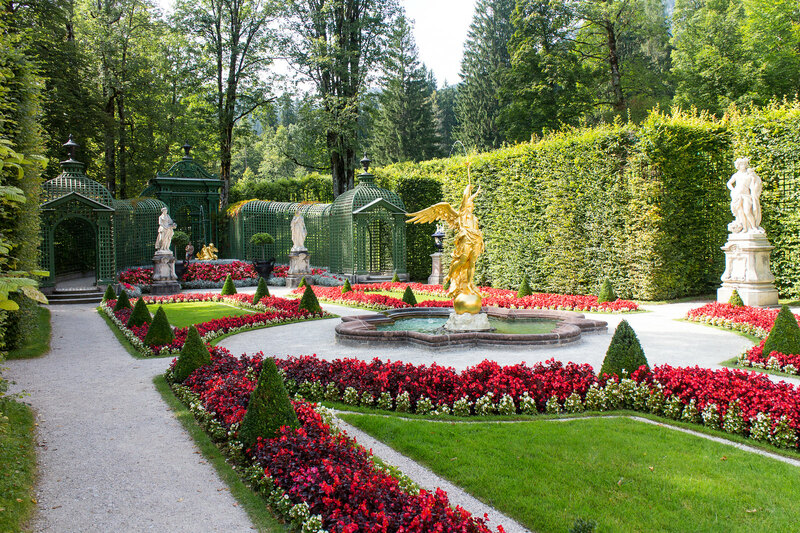 And it’s not just the interior of this palace that made me stop and stare, the gardens are perfectly manicured with the most bright and beautiful flowers, bushes, fountains and sculptures. I could have wandered around for hours if it were not for the scorching heat on the day we visited. 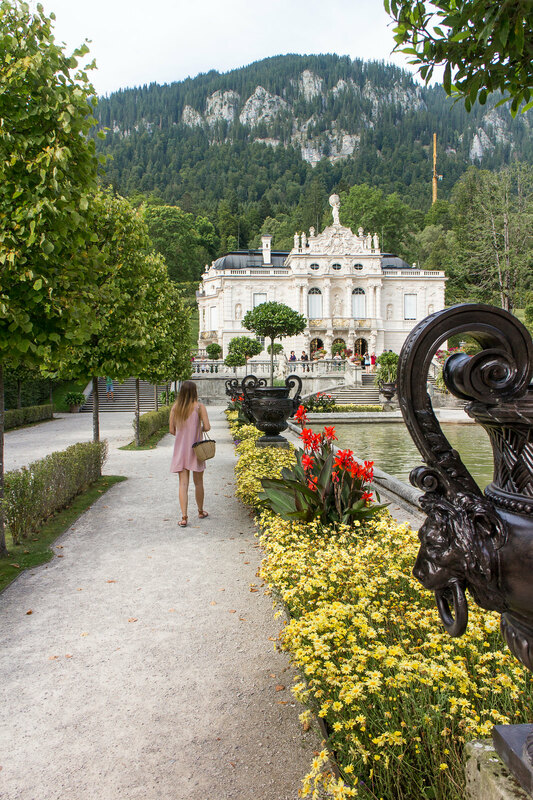 Where Linderhof differs from Neuschwanstein is the setting, this palace is tucked away in the valleys of the German countryside, and you could easily miss it if you didn’t know it was there. But this little gem is certainly one you don’t want to miss. After spending a day visiting both of these Bavarian beauties they truly stole my heart. Both different but both equally incredible and worth a visit. And with only an hour between them by car, there’s no reason not to check both off your list next time you’re in the area. And I definitely think you should book a trip to this wonderful area at some point in your life.